This past week was very mellow. Rollie had a bad cold midweek, and Lily got the sniffles too...everyone's back to normal now and I of course avoided it yet again (thankful for a great immune system...hopefully Lilys building one up too). 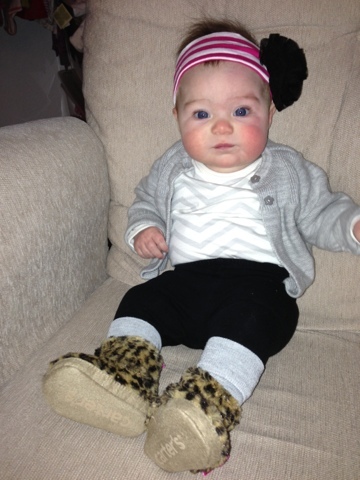 Jessica (our babysitter) spoiled Lily again with new black & grey stripped tights and super cute silver sparkly shoes. She had all boys so she loves being able to buy girly things. Tuesday we enjoyed playgroup at Dawn & Ariyas, then had a great walk with Melissa & Jack. After walking spring lake our new couch got delivered! We LOVE it!!! My mom arrived this afternoon and is here all week and I'm off work!! Duckhorn closes the last week of January every year for renovations. We have alot planned...decorating the house, wine tasting, San Francisco, lots of long walks, bodega bay, and of course just spoiling Lily! 5 months with our little angel...I can't believe it. This age is so much fun! Weight: I'm guessing around 14 pounds. I still get asked all the time, 'how old is she?' and when I say 5 months, people always say...'oh she's so small!' which is just so funny because she was 8 pounds when she was born...not small! Diet: Mostly breast-milk but we are supplementing formula once a day while at daycare. I'm hoping to last 9 months with breastfeeding. We also tried oat cereal and sweet potatoes recently. She loves oat cereal but was kind of indifferent with the sweet potatoes. Oh, and at playgroup today she devoured a num num cracker...will be buying those soon. We (lily and I) had a great day today with my friends Meghan & Melissa. Melissa and I have a slight addiction to blogs and pintrest, so today we decided to actually do something with our 'craft' board. Before heading out we watched an episode if Peter rabbit cartoon (which I didn't know existed, but it was one of my favorite books as a kid) while Lily snuggled her own rabbit. I headed over to napa to pick up Meghan and then we continued over to Vacaville. Before we got down to crafting we went out for sushi...and it was some of the best I've had...so good!!! We went to Michaels and picked up some paint and canvas for our ombré prints. I think they turned out pretty well. I hung mine in our guest bathroom that needed some fun art. Also I did this while carrying Lily in the ergo for close to 2 hours! Not too much to report on this week. 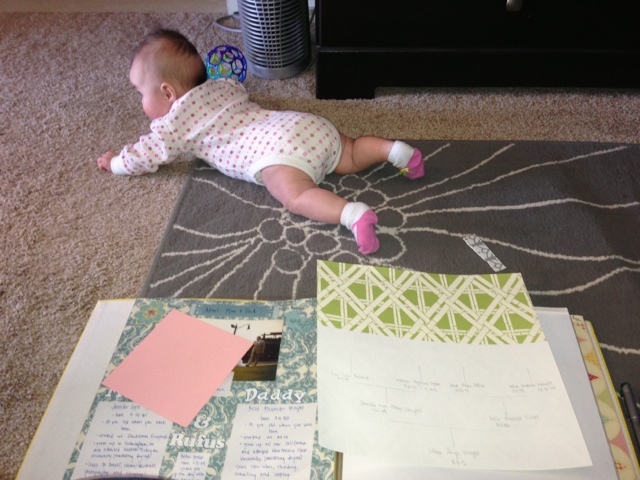 Monday lily was definitely doing some major teething and was super fussy so we stayed home and I attempted to work on her baby book when she allowed me. Tuesday was playgroup at Miceala & Ensleys where lily of course had fun with all the babies and I had fun with my mom friends. Wednesday was back to work but I got an adorable picture from our babysitter of you sucking your thumb...and then that evening we tried out the ergo carrier for the first time at whole foods. The bjorn was perfect for 0-4 months but my back was hurting too much. So far the ergo seems great, I really love the zipper pouch for my keys/cards/phone. I had a longer end of the work week with an extra half day in Sunday so Rollie got lots if quality time with lily. I ordered a foam puzzle mat that came this week and lily just loves it...needed more baby friendly floor space. We had a relativity busy week but at the same time relaxing if that makes any sense. 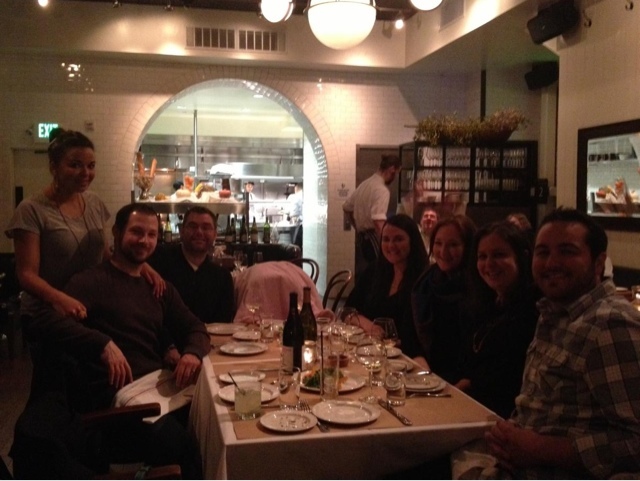 Sunday we had dinner with friends in napa at a new restaurant called the Thomas at fagianis. Everything was great, the food, company and atmosphere. 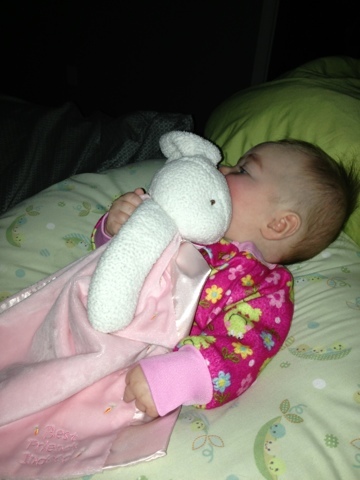 Not to mention lily slept for 3 hours during dinner/drive home. I know we only have a few more months of this before she's on the go so we are enjoying it now. We've decided to start a 'dinner club' with a few friends, meeting once a month at a new restaurant, can't wait for next month! Tuesday I had playgroup which us always great and then we went in the search for a new couch. We found one and its being delivered on the 22nd! On Saturday night we set up Lily's big girl highchair for the first time and tried giving her oat cereal...she loved it! I can't wait to see what other foods she going to start enjoying. We even had to change bibs half way through because it was all over her!